It was nice 4-day long weekend at the beginning of May. We'd already heard many interesting stories about Slovenský raj (Slovak Paradise), so we decided to try it for ourselves. Slovak Paradise is a National Park situated in East Slovakia. You can check its location here . This mountain range isn't very high – the highest peak there is Ondrejisko - 1270 metres. What makes this area especially interesting is hiking trails equipped with ladders, chains and bridges . We stayed in Hrabušice at Privat Beata . The host was friendly, our room was nice and clean, and, most importantly, the facility is located close to hiking trails - we went for hiking on foot from our hotel. The only inconvenience is the fact there's no restaurant available, only kitchen (fortunately, fully equipped). On the first day we decided to go along Suchá Belá to Kláštorisko (green trail). We set off from Autocamping Podlesok. Suchá Belá's a beautiful canyon. The trail's medium difficult with wooden and iron ladders, chains etc. And it's one-way – you can only start hiking from camping Podlesok. The most difficult part for me was going on slippery wooden logs. It was very tricky not to slip into the stream which was flowing briskly just right under our feet. After about 2 hours we got to Kláštorisko mountain hut - the only one available in Slovak Paradise. The place got its name from nearby ruins of Cartesian monastery which was built at the end of XIII century (!). The place's great – I was very impressed by the view of ruins surrounded by beautiful forest. There's also a big nice plain on which you can lay and contemplate the nature And the fried cheese with chips served in Kláštorisko restaurant is a must! We were so delighted with Slovak Paradise that we decided to hike on blue trail Prielom Hornádu - for me it's the best hiking trail in Slovak Paradise. In this canyon there are iron steps fixed on the rocks several metres above rapid Hornád river. I think that my adrenaline level was at the highest on these points. Finally, we got to Podlesok Ranč restaurant and had the best garlic soup ever! Next day, we went to check out an interesting yellow trail – Stredné Piecky . We started hiking from Hrabušice Pila . In this village there's a parking space but we decided to leave car just right at the point where the trail starts. Again - steps, ladders, slippery logs and beautiful waterfalls along the trail. When we got to the route crossing we chose blue trail and after a while, at Mala Polana (986 metres), we got onto the red trail. At the last part of the red trail we went onto yellow trail which leads directly to Hrabušice Pila. In general, the trail was OK, we had fun but at some point it started raining, so we needed to speed up our hike. That day in the evening we met with our friends who stayed in Podlesok campsite . They weren't very content with their place – someone stole their DSLR camera! Besides, it was cold at nights - it was only the beginning of May and the stream was close, so the temperature at nights dropped significantly. In the morning we went to Hrabušice Sokol to start hiking along Veľký Sokol . It was rather long hike. After several hours we got to Glacká cesta (898 metres) and got onto red trail. Then, at the same place where the day before (Mala Polana), we started climbing down along red trail directly to Sokol. On our way back we were surprised by cloudburst. In general, Slovak Paradise is great place both for families with children (we saw many) and for thrill-seeking hikers who want to try themselves on some more demanding trails. The artificial facilitations on the trials make Slovak Paradise one of a kind in this part of Europe. 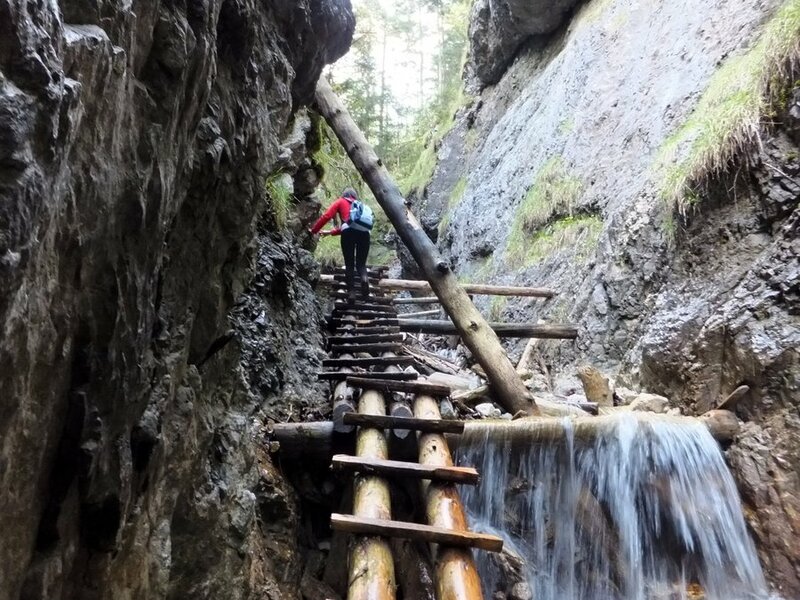 What's worth remembering when going to Slovak Paradise is that the most interesting trails with ladders and chains (all mentioned in this post) are one-way . And there's quite a lot of people so it's not that easy to get away with going against the stream. On our last day we decided to go to Aquacity water park in Poprad . It was very relaxing experience – there are nice waterslides, indoor and outdoor thermal pools, water massages - great thing after several days spent on hiking! Added bonus are hot thermal pools which make your skin nice and smooth - there's loads of minerals in this water pumped deep from under the mountains.